Beautiful Beach House on East Grand Traverse Bay! ENJOY SPECTACULAR SUNSETS OVER OLD MISSION PENINSULA! 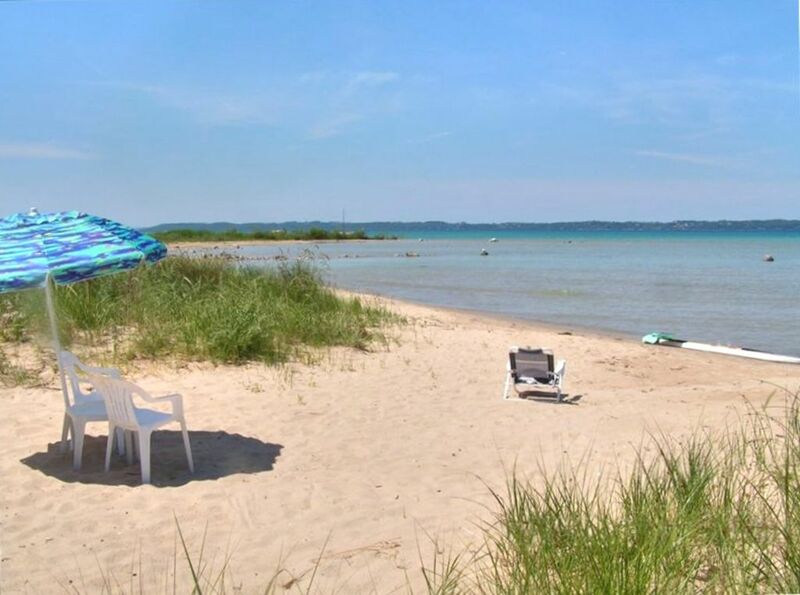 Beautiful beachfront home is located on 100 feet of private, sandy East Grand Traverse Bay. This perfect vacation spot is only a short walk down the beach from the shops and restaurants of the village of Elk Rapids and only 15 miles from Traverse City. Great swimming, fishing and boating are 20 steps out your back door and fantastic golf resorts, shops, casinos and restaurants are a short drive away. Enjoy a bon fire on the expansive sugar sand beach while watching the beautiful sunsets over the Bay. Then let the sounds of the waves lull you to sleep. The house has a large private master suite upstairs and two bedrooms on the main level all together sleeping six very comfortably. On the lower level is a spacious kitchen with ceramic tile and all new appliances and living and dining areas with hardwood floors. The kitchen, dining and living areas all have fantastic views of the water. In nearby Elk Rapids there is complete marina and boat launch facilities as well as boat and jet-ski rentals. Elk Rapids is also known for its antiques stores, quaint downtown area, historic movie theater and more. Family with 3 children. We balance our time at the beach house along with weeks provided to guests. As parents, we love the quality time we spend here and the memories we are making with our kids on the beach, in the water, roasting marshmallows, riding bikes, walking to town, etc. Basically, getting away from hectic schedules and enjoying time together - all in a very beautiful spot! Great home right on the water with beautiful sunsets! My husband, our baby and I just returned from this home and had a wonderful week. The house is just feet from the bay and there's plenty of private beach to relax or play. The best part of the home is the huge windows overlooking the water - from the kitchen and bedrooms. Delightful to look at! This house is located in Elk Rapids which is a charming one-stoplight town with a great public beach and playground for kids, but also close enough to pop into Traverse City for shopping or dinner. The photos are accurate as every night we enjoyed a beautiful sunset. The homeowner was extremely hospitable and very easy to work with. I'd say it actually sleeps 8 instead of 6. This was our first time using VRBO and we were very pleased!